Spoil your inner fanatic and be the envy of all your friends when you display this authentic full-size Revolution Speed football helmet by Riddell. It's great for collecting autographs or to show off in your fan cave or office. 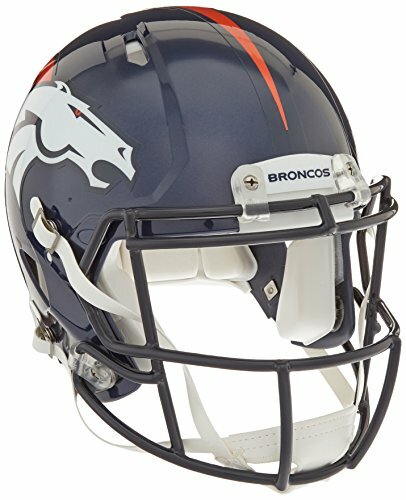 Large shell, aggressive facemask, authentic internal padding, and 4-point chinstrap Available in official team colors and decals This helmet is not for competitive play Officially Licensed With its new distinctive shell design, the Speed helmet is being adopted by premier athletes at a furious pace. Large shell, aggressive facemask, authentic internal padding, and 4-point chinstrap. Available in official team colors and decals. Great for autographs. Collectible, not to be worn for play.